Today I want to share Linda's journey. Linda moved in with her father after her mother passed away and has been taking care of him as well as her own family. She's a busy lady! Her mom was a pack-rat and Linda has been working hard to declutter this blended home. 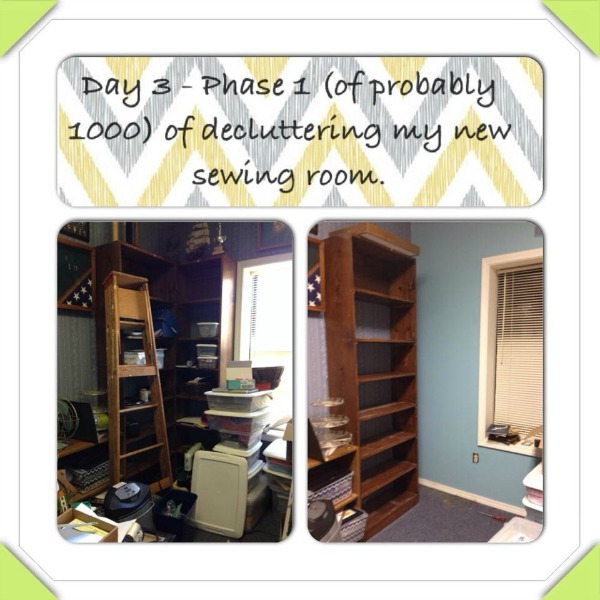 Linda made a decision nearly 2 years ago (April 2014) to join the 365 Items in 365 Days declutter challenge and since then she has decluttered hundreds, probably thousands, of items from her home! 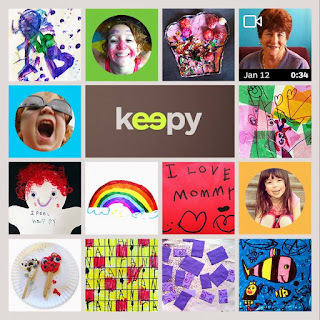 She actively participates in the 365 Items in 365 Days Facebook group, showing us her before and after pictures, asking for the courage to declutter some of the tough items, and encouraging other participants on their decluttering journeys. 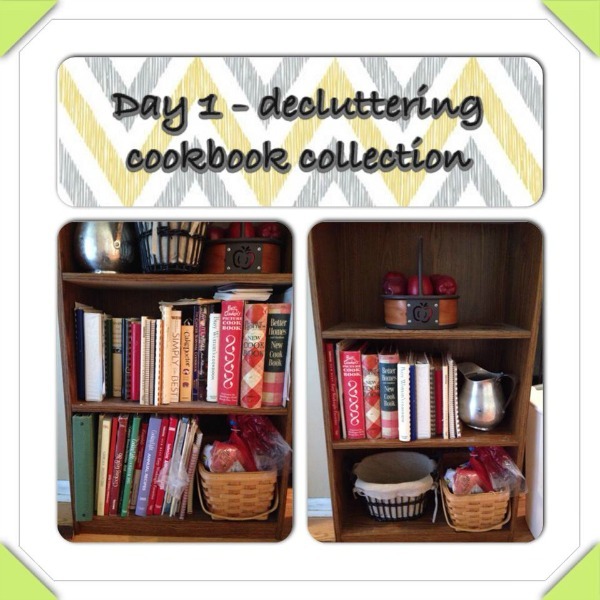 Today I want to share a few of Linda's decluttering successes to inspire you on your decluttering journey! 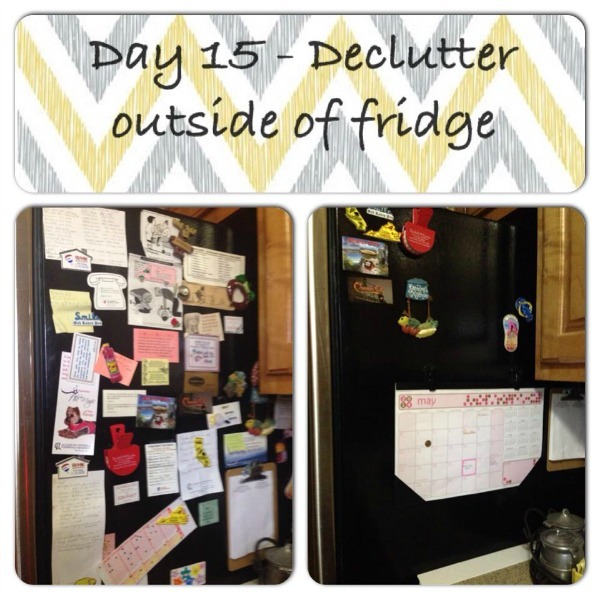 Linda didn't just declutter one item per day... when she first started this challenge she tackled one AREA every day! Which meant great before and after pictures... and Linda shared them with all of us to inspire everyone to declutter. 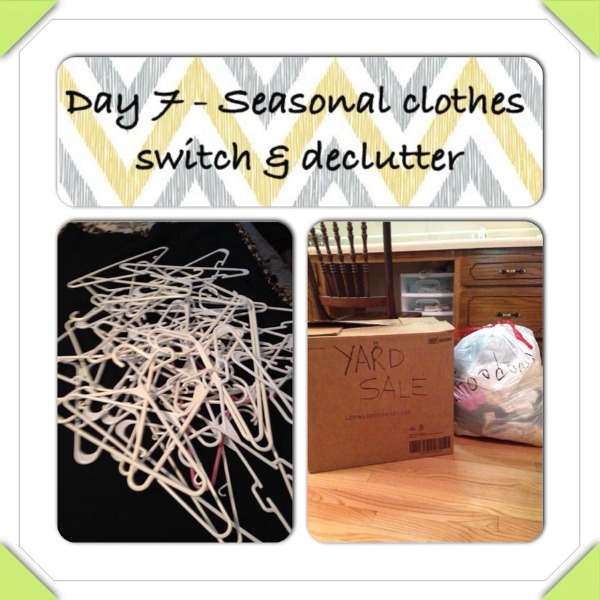 She also tackled her clothing... on day 7 she donated 28 items and add 14 items to a yard sale box. This has been an emotional journey for Linda because many of the things she was dealing with were her mom's and it was hard to change things in "her" home. Slowly but surely she's finding the delicate balance between keeping things familiar for her father while making it an uncluttered home of her own. Like the outside of their fridge, which had many things that were her mom's. 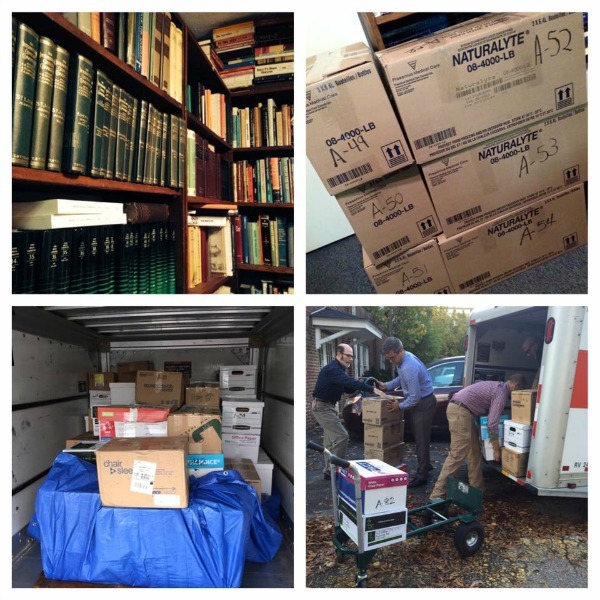 One of the major decluttering projects Linda has tackled is her dad's study. Her dad was a Bible scholar and had a library of over 3500 books. Sadly, due to his dementia, he was no longer able to use them. It took a long time (over a year! ), and a lot of patience, but Linda catalogued them and found a new home for them. After 4 years, I can finally say that I have donated approximately 3500 books from my Dad's library to a Bible University. It was a lot of work cataloging and boxing and a lot of tears as I let go of my Dad's legacy of teaching God's Word. But as Dementia steals the scholar and the Dad that I knew, it was time. I know it was a tough thing to do, but I'm sure knowing other students will be able to use these books made it a little easier. And, as a bonus, now Linda is able to use that space for her sewing room. One of the things I love about Linda's participation in the group is that she asks for help making decisions that are tough. Often she knows what she wants to do, but needs a little push... especially when the items she's deciding on were her mom's. 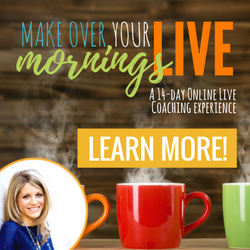 She had 19 people give her advice and encouragement to help her decide! Group members gave her suggestions on places she could sell or donate it to make the decision easier. They also suggested ways some of the items could be re-purposed to help her organize different areas in her home. One person suggested she think about how she would be able to use that space if it's not filled with things she doesn't use. One member even said she'd let go of her Tupperware if Linda let go of hers. Thank you Linda for being such a wonderful member of our group! And for sharing your story with us. 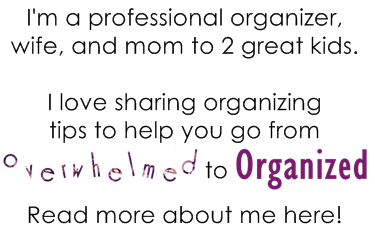 And I especially want to thank you for being willing to let me share your decluttering journey here, in the hopes of inspiring others to join the challenge and start decluttering their homes! So how about you? 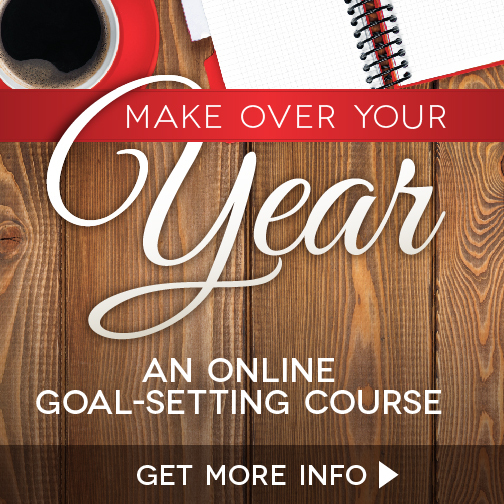 Have you been putting off joining the 365 Items in 365 Days challenge because you think it will be too hard? If you have, then please don't delay any longer! No matter how busy you are, you can find time to declutter one single item per day. It's not overwhelming then. You don't have to find time in your schedule to declutter a whole room. Just find one item every day that you no longer need, use, or love. And if once in awhile you have time to do more you can. If you need some encouragement because you're decluttering sentimental items, you got it! Just like Linda. 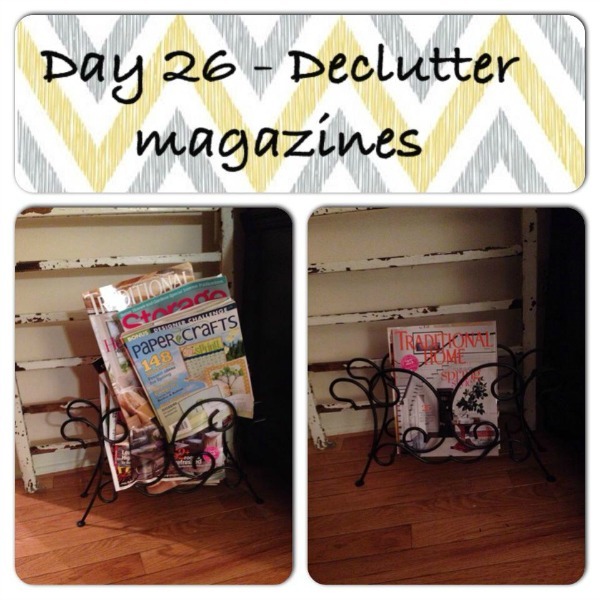 If you're overwhelmed by clutter, then join the 365 Items in 365 Days Challenge today and get started. A little bit at a time makes a big difference. Start purging and start living the life you want. What's your motivation for decluttering? What holds you back from purging? What area of your home will you tackle first? Labels: 365 in 365, 365 Items in 365 Days Declutter Challenge, books, decluttering, purging tips, sentimental items, We Did It! So Can You! What an inspiring story. To see real people making the challenge work for them! You do such great work Hilda.. and nice job Linda! When it comes to my clutter, I'm good at getting rid of it. It's so much harder when it's from someone you recently lost. This was a great story. Thanks for posting, and thanks to Linda for sharing. It's definitely harder to declutter items from someone you've lost Cari! I haven't had to do that myself thankfully, but I've been part of that journey with others and it's tough for many people. Hopefully Linda's story helps other people realize it's possible! What amazing transformations! Thanks for sharing. I think it is so important to see inspirational photos like this because it gives us ideas to take action and doesn't allow us to feel defeated. =) Thanks for sharing. What an uplifting post! Thank you for introducing us to Linda. Her before and after photos are so inspiring for others! Before and after pictures are such a great way to see progress and be motivated to continue decluttering aren't they Sarah?! 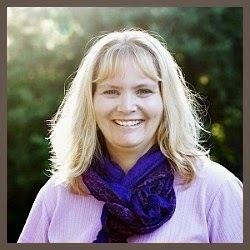 Linda did a wonderful job despite difficult circumstances didn't she Liana? It really shows that anyone can do it! This was very heart-warming. I can so relate to Linda's reluctance to part with things that had belonged to her mother. When my mom passed away (nearly 20 years ago), I felt the same way and kept a LOT of stuff I really had no use for. I've since let go of some of it, but I'm sure I could find more that is just sitting in my closet taking up space. It's really tough to let go of things from parents after they're gone isn't it Janet? I love hearing stories of people who were able to sift through and keep the treasures but let go of things that were holding them in the past. I hope you're able to let go of more things in your closet! Printable Signs to Help You Declutter!